I’m rounding up my all time favorite winter wardrobe essentials. I love reading up on new trends and trying to incorporate them in my seasonal style but having a great foundation is a must. 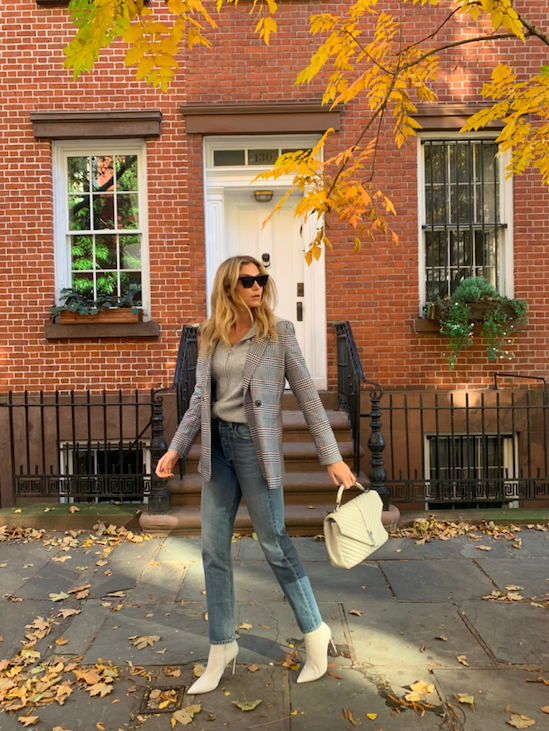 Whether they be investment pieces to last you through the years or easily replaceable staples, trust me, having great classics to pair back to will make styling outfits all the more easy. Scroll through to see my favorites. A black blazer is a great piece to polish up an outfit and make it look instantly more elevated. While a blazer pairs well with slacks for business meetings, it doesn’t end there, you could dress up a pair of jeans and a band tee. A checked blazer is a chic piece everyone should own. A relaxed silhouette layers easily and moves with your body to define your frame. Wear it with a bodysuit and chic shorts or make it cool with denim and combat boots. If you’re daring, a cool way to wear a plaid blazer would be to team it with matching pants for a head to toe boss-babe look. Everyone should own a great fitting basic tee to layer with. RE/DONE makes a great vintage-feeling top that pairs back to basics and novelty pieces alike. It’s relaxed in the shoulders and slim fit throughout for that perfectly worn in feel. Wear it with jeans and cool sunglasses for a model-off-duty look or as a layering piece. No wardrobe is complete without a form fitting bodysuit that lays seamlessly when tucked in. Wolford makes the best of them with their signature knitting technique for a smooth and second-skin feel. I love to layer the turtleneck style under jackets or alone with denim and heels for a great date night look. I prefer to wear the scoop neck style in the summer with boyfriend jeans and a cute sandal but its a great layering piece year-round. A signature pair of black denim will pair with just about anything in your wardrobe. You could dress it up with a blouse and pumps or make it cool with an edgy jacket and sneakers. The possibilities with this one are endless. I would start out with a skinny or straight leg fit and then you’re ready to add some relaxed fit or ripped styles to your closet. As you may know, grey is one of my favorite colors to wear because it pairs back to everything. I find it looks beautiful with beige for a sophisticated neutral look and I’m just obsessed with a monochromatic grey and black outfit. Gray jeans are a must in my book. Blue jeans are the foundation of so many outfits and they come in so many different washes. My favorite timeless look is a lighter wash to dress down any outfit and make it instantly cool. I’d say they’re the most versatile piece in anyones wardrobe and could be easily paired back to any top or shoes you own for an endless amount of looks. Living in NYC, it gets pretty cold in the winter months but no matter where you live I think it’s important for everyone to own at least one black or beige cashmere sweater. Whether you layer it under a blazer or over a tee for a cool look or just wear it when you travel to keep cozy, you’ll find it to be a key piece in your wardrobe. Wear it all winter long for added warmth and pull it out on a chilly evening or long flight year round. In regards to cold-weather musts, a peacoat is essential. It could be worn open on a cooler day for a chill vibe and easy styled look. On frostier days, layer it with warm accessories and tie it up for a put-together winter look. They come in infinite silhouettes and colors so you could buy one specifically for your body type and aesthetic. Personally, my go to style is a long version with a tie waist. A good leather jacket will never go out of style. We all know leather jackets are the ultimate stylish piece and they come in many silhouettes for different overall looks. If you’re not into the edgy moto look you could opt for a streamlined collarless cropped style or a boho fringed version. Whatever style works for you, a leather jacket could be worn over anything from jeans to a fancy dress. Once you feel this cozy lambswool scarf, you’ll want to take it everywhere. The oversized fit is perfect to keep you extra warm on cold days and makes for a great travel blanket. Its so versatile and comes in every color imaginable, you’ll want more than one. I hope you enjoyed my favorite winter pieces and if you’re missing any, you feel inspired to add them to your closet. Let me know if you think I missed any classics. © 2016 - 2018 Brokers and Bags. All Rights Reserved.